Samsung's latest semi-rugged smartphone for AT&T dials back the good looks of the Galaxy S7 in favor of a stronger, studier frame. The S7 Active is tough enough to take a tumble without the brick-like bulk of some fully rugged handsets. 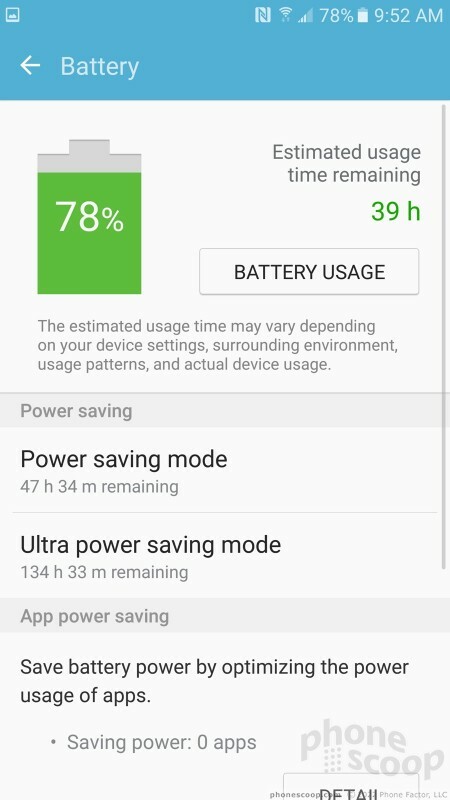 This Android phone also delivers excellent battery life. Here is Phonescoop's full review. The Galaxy S7 is one of the best smartphones you can buy, but it's not for everyone. The glass-and-metal design is slim and attractive, but also somewhat fragile. The S7 Active packages the S7's features into a tougher, more resilient piece of hardware that can handle the abuses many phones suffer day in and day out. 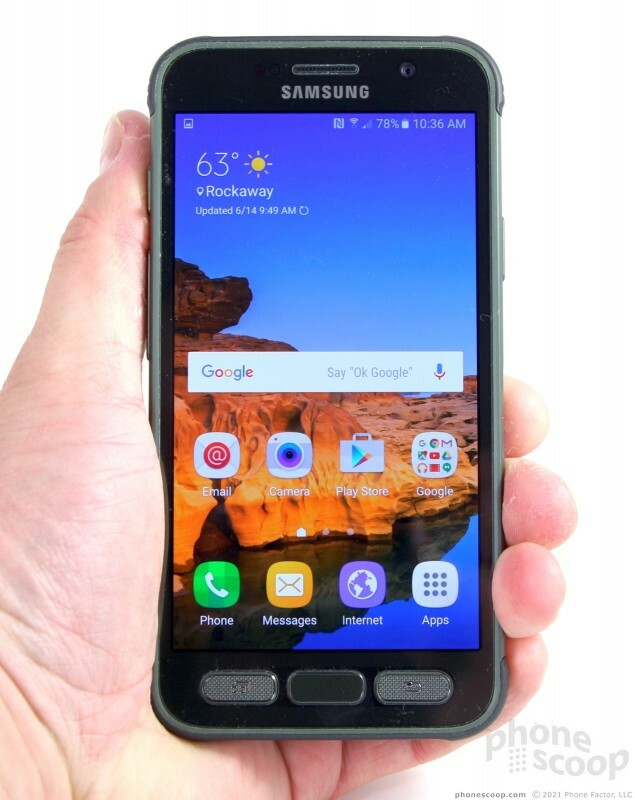 If you spend more time outdoors than in, or simply want a phone more apt to make it through your next business trip/vacation, the Samsung Galaxy S7 Active is a top contender. 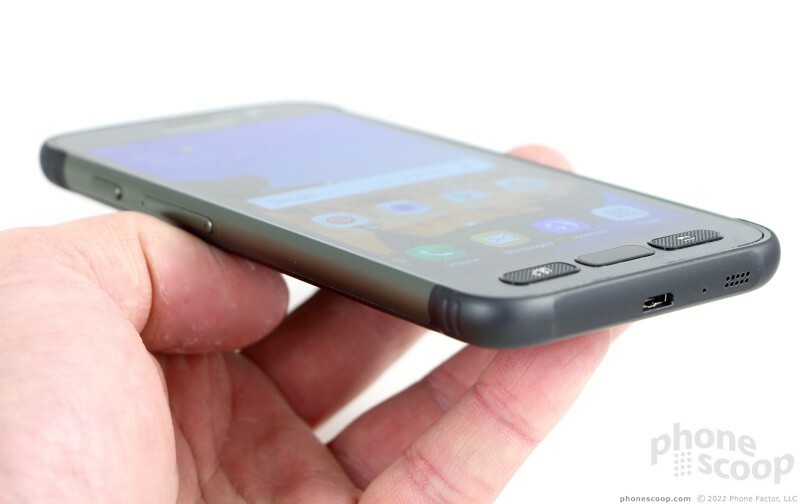 The S7 Active is not a super-rugged device like those from Kyocera; think of it more like a Galaxy S7 embedded in a really good case. Finding the balance between strength and design is often a game of give-and-take. I don't think there's any question that the Galaxy S7 is a brilliant piece of hardware, but this comes at the cost of durability. The dual glass surfaces mean the phone is twice as likely to break when dropped, shattering not only the glass but your heart. 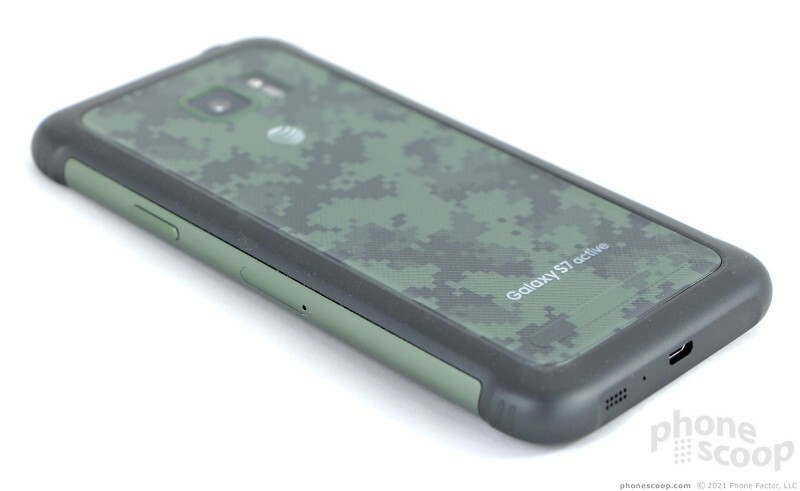 At the other end of the spectrum, you have something akin to the Kyocera DuraForce XD. You can run over the XD with your car or drop it down a set of concrete stairs and not damage it, but dang if it ain't big and a bit ugly. For those Game of Thrones fans, the S7 is Ser Jaime Lannister, while the DuraForce XD is Gregor "The Mountain" Clegane. The Galaxy S7 Active is somewhere in the middle, perhaps Tormund Giantsbane. Samsung ditched the rear glass surface and stuffed the S7 Active's beautiful screen into a thick(er) metal chassis with rubber corners and a polycarbonate rear shell. 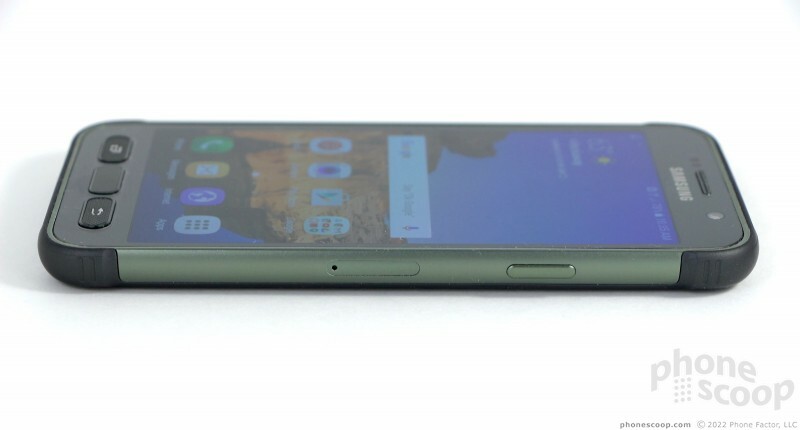 The Active is bigger, heavier, and less attractive than the S7, but far stronger. 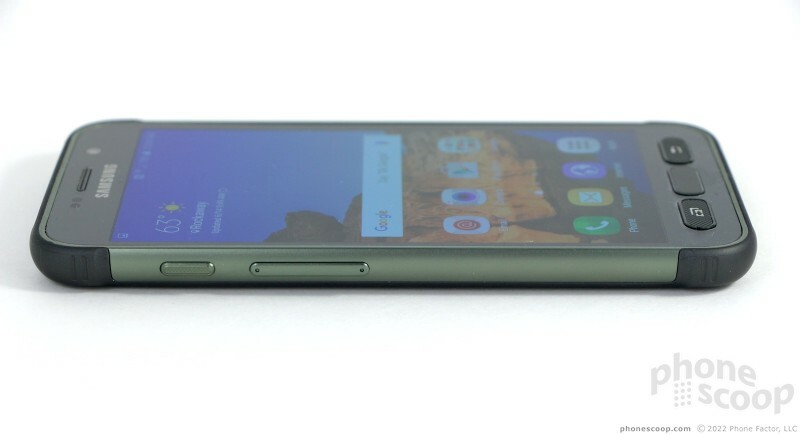 For example, the S7 Active is about 20% heavier. The tougher, weightier chassis is certified mil-spec 810G for protection from drops, temperature extremes, and dirt/sand. The phone carries over the S7's IP68 rating for protection from water. I dropped the phone, kicked it, let it sit in the sun for a few hours, and left it in the river near my home to test these features. The S7 Active held up without a scratch. Even though the phone is larger than the standard model, it's still fairly svelte. There are plenty of bigger, heavier phones out there (e.g., Apple iPhone 6s Plus) that aren't ruggedized. The S7 is compact enough to use in one hand most of the time and it should fit into most pockets without trouble. You will feel it in your pocket, and I found the rubber corners sometimes caught the lining of my pockets. The materials are great. The glass, metal, rubber, and plastics are all top notch. Few phones feel this solid and strong. 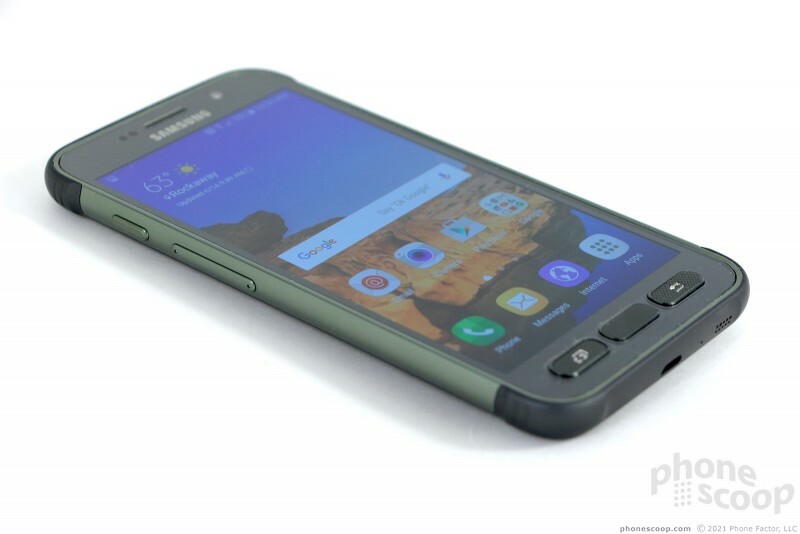 There's absolutely nothing cheap about the S7 Active, and it has been assembled tightly. 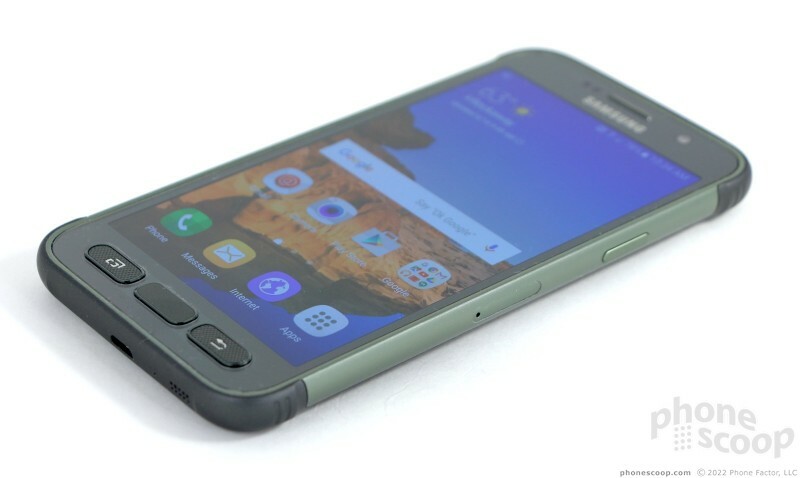 The green on green on green coloring gives the S7 Active a bit of a muted look. The same is true of the gray model; the beige model is brighter. About 80% of the left and right side edges of the S7 Active are formed by metal. 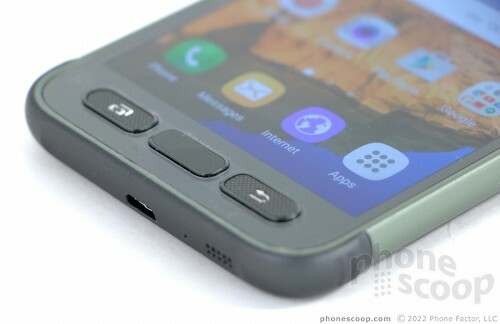 Rubber bumpers wrap fully around the bottom and top edges of the phone. The left side houses the volume toggle and textured user-programmable action key. The volume toggle is a slender, smooth button with a generous profile. The action key is smaller, but its profile is a hair bigger. I was able to find and use both buttons with no problem; action and feedback is fantastic. The screen lock button, positioned on the right edge, is similar to the action key in that it is small and has a raised profile. It offers excellent travel and feedback, too. The combo SIM/memory card tray is tucked into the right edge. It is a solid tray that holds the SIM card on one side and the memory card on the other. 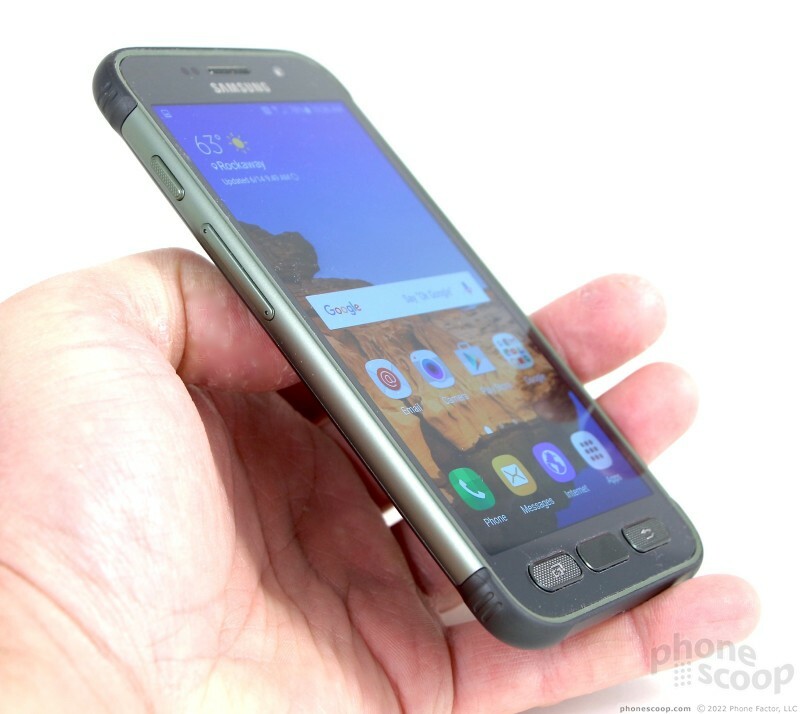 One thing I love about the Galaxy S7 is that Samsung was able to waterproof the phone without hatches and ports. That means the USB port and headphone jack are exposed, but won't let water into the phone's inner cavities. It's a wonder Samsung was able to do this on a handset to slim. 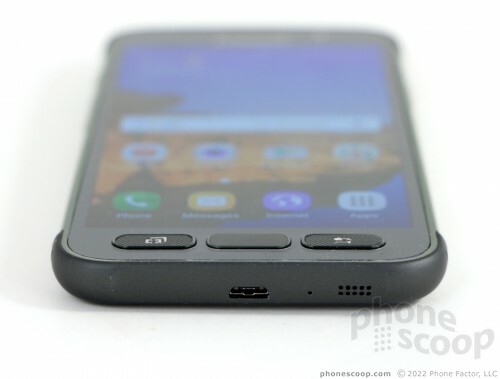 The S7 Active has a USB port on the bottom and headphone jack on top and, like the standard S7, both are protected. Microphones are placed on both the top and bottom edges, made visible thanks to the pinhole opening. 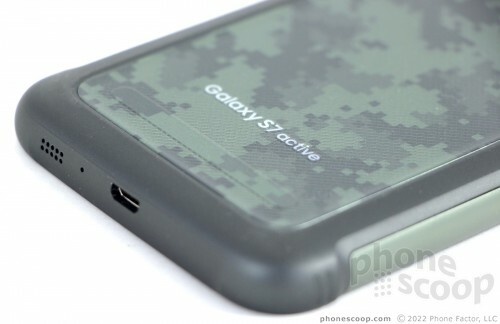 Samsung drilled some holes in the bottom edge to allow sound to escape the speaker. 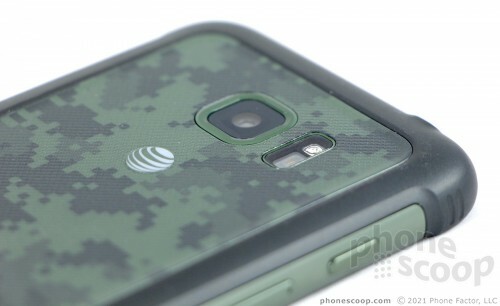 The rubber that forms the top and bottom end-caps wraps around the back edges of the phone, framing out the polycarbonate panel that forms most of the rear surface. The rubber is thick, leaving the rear panel sunken in a millimeter or so. I like the coating on the panel, which has a gel-like feel to it. 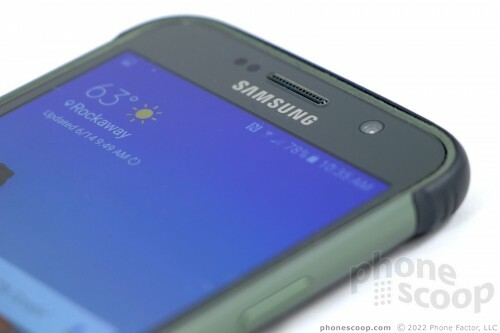 Samsung placed the camera module near the top, with the LED flash and heart rate monitor. You cannot remove the rear cover of the phone and cannot access the battery. 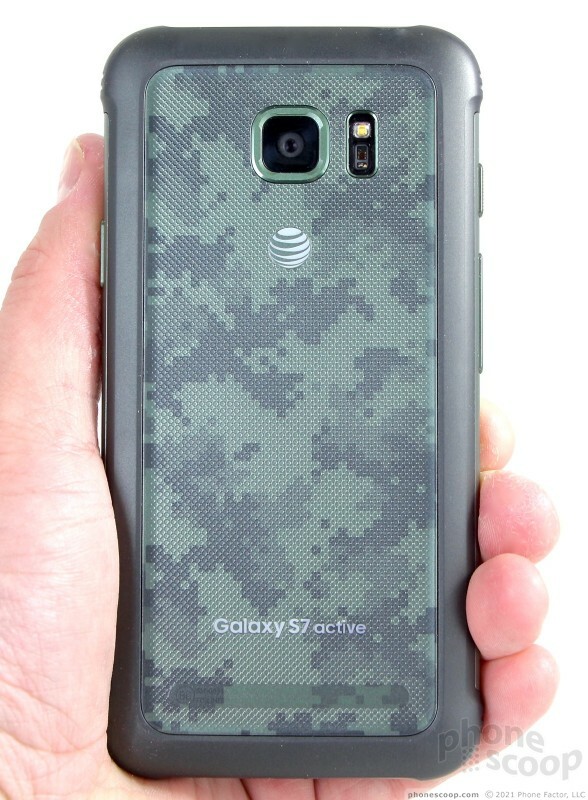 The S7 Active — like the S7 and S7 Edge — is sealed up tight. This might annoy some people, but I think most will be able to live with it. 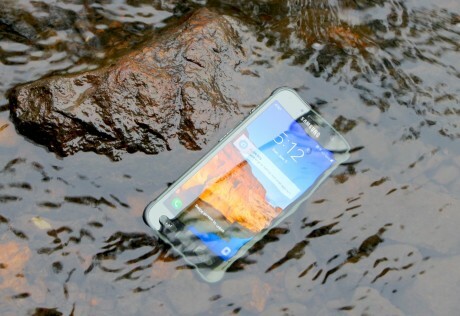 It may not be much of a looker, but the Samsung Galaxy S7 Active is a sturdy, well-made phone that stands up to rough treatment and unexpected swims. 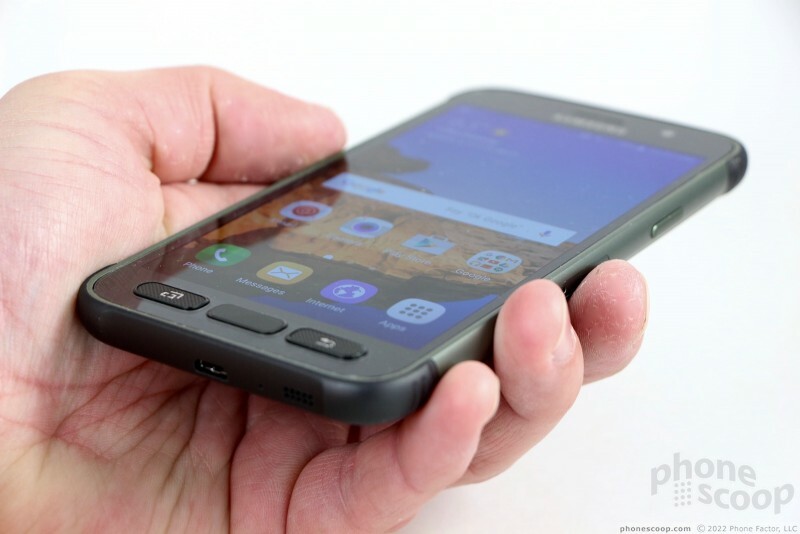 That Samsung was able to create such a tough phone without the brick-like design of other rugged handsets is a bit of a wonder. Samsung says the S7 Active's 5.1-inch quad HD display is more resistant to breakage than the standard model, but didn't say how. I held the Active next to the standard model and could not see any differences between the two screens. The Super AMOLED display is lovely. The resolution density is about as high as it gets, with 3.67 million pixels adorning the display at 576ppi. The S7 Active offers one of the sharpest displays available. 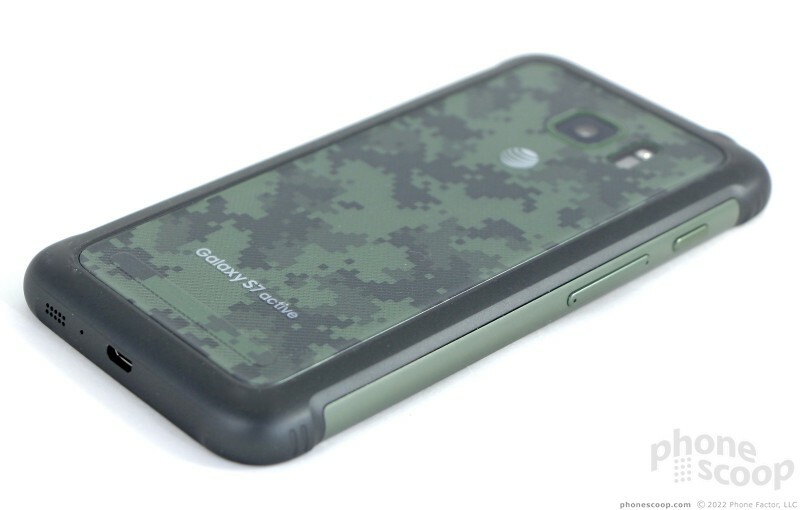 I found it to be nice and bright, without the overly garish color representation that's typical of Samsung phones. That means it's more accurate. I didn't have any trouble using it outside, and viewing angles were excellent. The phone includes wet-finger tracking, which means it can be used when wet. I was even able to use the touch screen while the phone was sitting underwater. The S7 Active runs swiftly on AT&T's LTE network. Tested around the NYC and San Francisco metro areas, it performed on par with other AT&T devices. Calls connected on the first dial without fail and the phone didn't drop or miss any calls. I was able to make phone calls in all coverage conditions, weak and strong. On the data side of the equation, the S7 Active was quick to download apps, load web pages, and scroll through image-heavy apps such as Facebook and Instagram. It produced excellent peak speeds, surpassing 50 Mbps on occasion. Voice calls sound very good via the S7 Active. Voices in the earpiece were plenty loud, enough so to overcome most typical spaces in which you might find yourself (home, office, car). Voices sounded clear for the most part to my ears, but there was some distortion from time to time. Volume and clarity were well matched. Those I spoke to through the S7 Active said I was loud and clear. The speakerphone maintains a good volume level, and clarity drops just a little bit. I was able to hear calls via speakerphone in the car, outdoors, in my home, and so on. The speakerphone was a bit more prone to distortion than the earpiece, but not in an egregious way. Ringers and alerts are incredibly loud and were always able to get my attention. The S7 Active's vibrate motor is much stronger than the standard S7's vibrate motor, which means I was more apt to notice it. 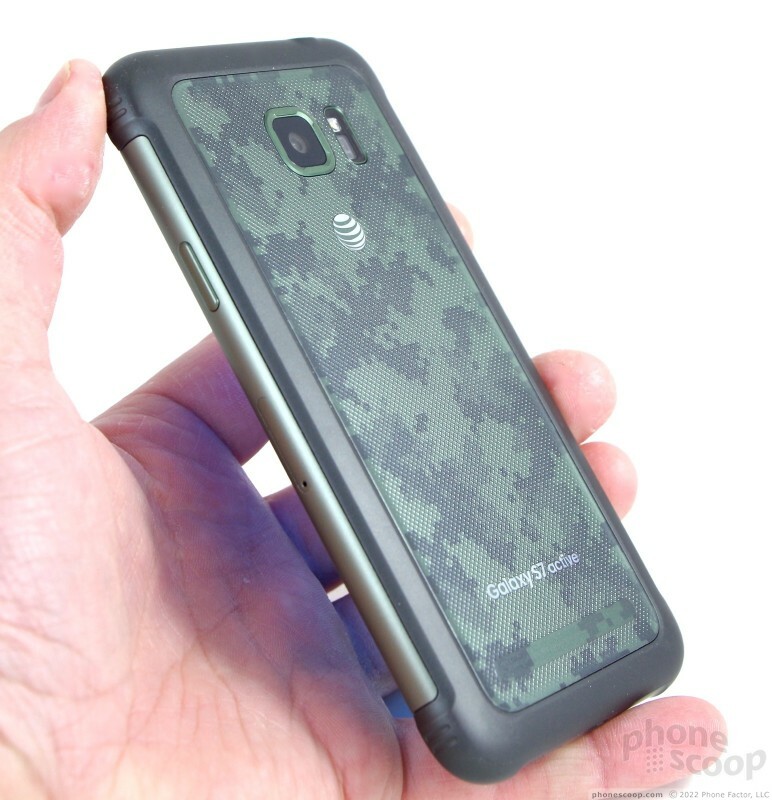 The Galaxy S7 Active provides upgraded battery life thanks to the huge 4,000 mAh battery. It has 33% more capacity than the battery of the standard S7. Aside from the rugged exterior, the battery is the only significantly altered specification difference between the two phones. The power cell pushes the S7 Active well past a full day and deep into a second. 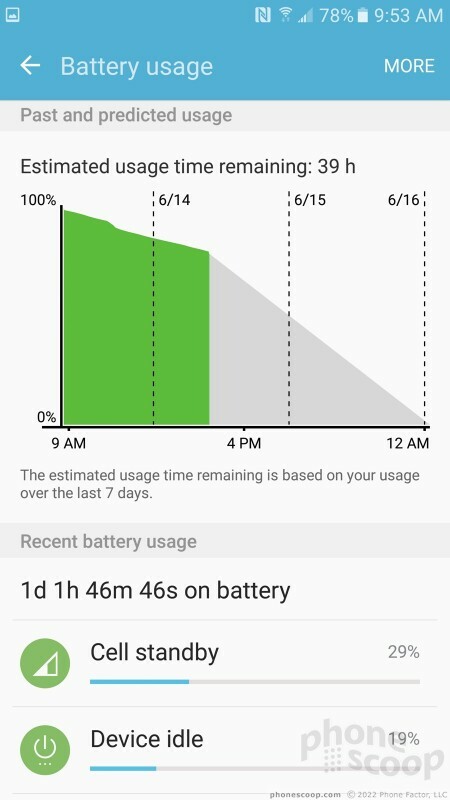 I consistently enjoyed 36 hours of battery life with heavy use. Times when I used the phone sparingly saw it last for two days. Few phones can claim to offer as much battery life as the Galaxy S7 Active. Even so, the S7 Active includes the typical set of Samsung power management tools. Samsung's Power Saver mode and Ultra Power Saver mode each offer distinct benefits. The former tones down the screens, notifications, and the processor to drum up a bit more life from the battery. 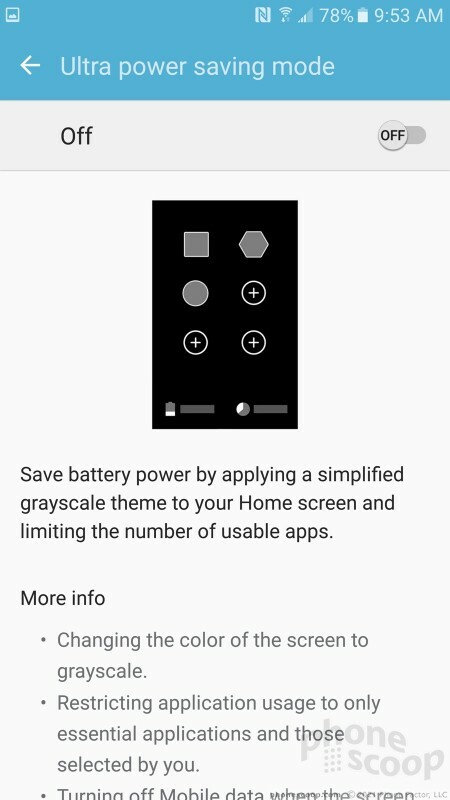 The latter puts the phone into ultra basics mode with a greyscale screen and severely limits apps to push through hours of basic communications. With a full charge, putting the S7 Active into Ultra Power Saver mode can deliver more than a week of battery life. The S7 Active supports Quick Charge 3.0 and rapid wireless charging. 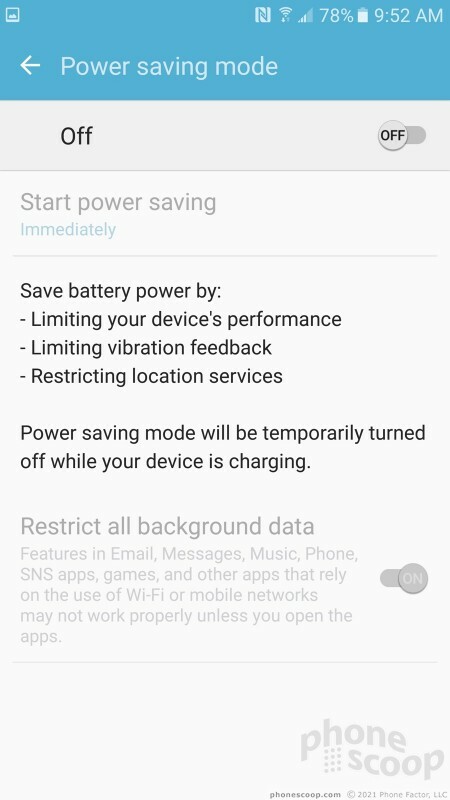 When plugged into the included charger, I found the S7 Active charged from 10% to 50% in about 20 minutes, and from 50% to 100% in 80 minutes. Wireless charging (using a dual-standard charger) took a bit longer at close to 3 hours. Samsung gave the S7 Active all the same radios found in the standard S7 and they all behaved in a normal fashion. I was very happy to use the NFC radio to help pair the S7 Active with a new set of stereo Bluetooth headphones I recently purchased. It was a snap: just tap and connect. The NFC radio can also be used to support Samsung/Android Pay. The Bluetooth radio itself did a great job. It connected to headsets, headphones, my car, and PCs with ease. Phone calls sent to headsets sounded pretty good and music sent to my new headphones sounded excellent. Together with Google Maps, the S7 Active was able to pinpoint my location in two blinks of an eye. Accuracy was as good as 20 feet, which is very hard to beat. It ran smoothly as a navigation tool and I relied on it to direct me around San Francisco via BART and foot. The WiFi radio was very quick.